this makes a lot of sense... you do something great, others attempt at copying, the attempted copies give even originals a bad name, the something great loses popularity. i’m not biased at all and have tried plenty of serrations from other companies. you guys do it best hands down. thank you for never giving up when se lost popularity. i love my se salts so much. oh, i meant to add earlier also... i really appreciate the 1/4-1/2” of pe spyderco leaves on their se knives. i think it gives a cleaner look and gives a little pe for those few tasks that benefit from it. outstanding design! I’m waiting for a se para3 on one of those crazy deals. Picked it up on a whim. Looking forward to giving it a better chance than the other se models I’ve had. I discovered the benefits of the SpyderEdge about two years ago when I used a Rescue 3 in preparation for a household move. I was very impressed by its ability to cut everything from cardboard to old garden hose to large plastic toys that wouldn't fit in the trash bin...all with relative ease. But what I've really been enjoying for the past few months is my fully serrated PM2. In my opinion, the FFG blade takes the performance of the SpyderEdge to the next level. I'm hoping that Spyderco eventually offers the Military and Police 4 in SpyderEdge. What really blows me away about those who seem to hate or despise serrated/Spyderedged blades is that I'm finding that many of them haven't even tried them. There are few tools that suffer the prejudice that the Spyderedge receives from a pretty broad base of knife users. And the excuses I get are pathetic in many cases. If everyone would just EDC/carry a full SE for at least a week I believe that could cure of lot of preconceived notions that many people are inflicted with. To me it literally became a necessity. But overall I do find it interesting that people use excuses such as the "sharpening" issue along with a laundry list of other gripes. When in reality they have never given them a fair trial. Like many,I got my Spyderco start in full SE. Then I realized that for some tasks such as whittling and where fine control and cutting is needed, that PE was better for a lot of things. EDCed one of each for a while, until I got one of the last ComboEdge Military. Still, when I am going into unknown situations I like to have both, and revert to one of each. I liked the idea of the full size Dyad ( and got one of the small micarta ones as a dress knife) but just could not get over how the stowed blade interfered with grip ergonomics. I suspect that is one of the things that Sal is working on on the redesign he has mentioned. I am also hoping the upcoming FRN Police will have a run in ComboEdge, as I have no doubt it will be offered in both full SE and PE, but those roles are already covered by the G-10 Police I have. I cannot tolerate the poor grip of the stainless handle versions. I think I might know why. I have some older militaries and to be honest the serrations are not great. Later Spyderco improved them and they are fantastic. My favorite is a Spyderco Military with partial serrations a later version I also have an earlier version with the more agressive serrations. In allot of ways spyderco did it to themselves. Had I purchased the earlier versions first I would never look at serrations again. Todays serrations however are spot on perfect. I don't have huge experiencence with SE on a variety of knives but what was said above by Doeswhateveraspidercan could be true since I've noticed variations in serrations on older and newer Enduras. And even Sal made a comment re them in a thread a short while ago. Photo of slight variations and I've seen deeper ones. Large and deep are the problem cutting even cardboard requires a great deal more force. The scallops even when sent back to Spyderco for reconditioning still catch and hold material in them. The newer serrations lock the material and slice cleanly the difference is night and day. They are also not so deep and pointy. I am thinking that back in the day it was to look tough but just does not make the cut in my experience. EDCed one of each for a while, until I got one of the last ComboEdge Military. I've owned a combo edged Military and Police model both. And those are both great combo edged folders because the longer the blade the better the two edge types. Speaking of the C-44 big Dyad model which is one of my all time favorites>> in spite of the ergos not being the best I still liked carrying mine and the concept of having one full sized plain edged blade with one full Spyderedged blade is a great idea and makes for a great Every Day Carry. 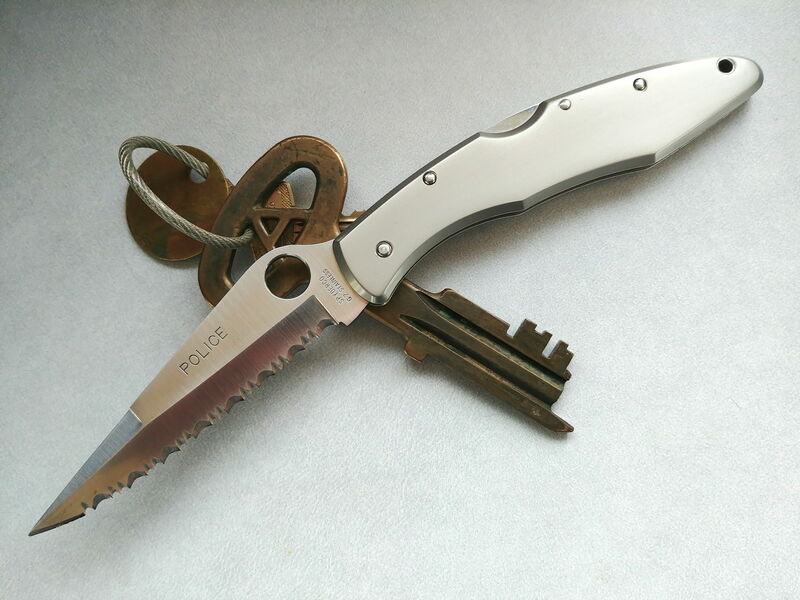 I would love a re-designed Dyad in a newer/better blade steel. Because even though I do have need of a plain edged blade I'm now to where I just can't do without a full Spyderedged blade. A Spyderedged blade is truly what I consider a necessity. And a new Dyad ( full sized) would be a most welcome addition to the main line up. I think the ergonomics of the Dyad are just over complicated. Just make the handle a simple shape and remove the thumb ramp from both blades and give the handle a thumb hole cutout like the Nilakka has so that when one blade is out the second blade is folded in flush with the handle. The blade either needs to be completely recessed into the handle or the blade spine needs to be shaped to mimic the shape of the handle ergos. I also fell in love with spyderco serrations after I got my full SE endura and carried it to work for a few days. I figured it couldnt possibly cut through cardboard like a PE, boy was I wrong. That thing eats through industrial grade cardboard like a zipper, no resistance. Zip ties, thick rubber hoses, leather, freakin anything and everything that SE endura can eat through. I do love plain edge too but as a working blade its SE hands down. It may not slice cheese as cleanly as my 110v military but who cares, I really havnt encountered a material yet that those spyderedges cant zip through with ease. Got a full SE police SS coming my way soon and I cant wait to use the hell out of it. I do like SE's on zip ties. They seem to hold it with no slip whereas a plain edge knife can and does slip or slide occasionally, enough to be aware of it. I know a perfectly sharp knife might not but when out bush working, doing things and cutting everything and anything you can't always have a perfectly sharp blade. That IMHO is where the SE comes into its own. You just captured my whole deal in your post. I bought a serrated ladybug like 5 years ago, and it was just the most useful thing in the world. It just cut so much better than plain edge knives that were much bigger. The SE LB is still my all time favorite knife forever. Because of the serrations, you just don't need so big of a knife. I've bought others since then such as a Dragonfly SE, but the LB is the one that goes everywhere with me. More recently, I got a sharpmaker and learned how to sharpen serrations. Way easier than I thought. Contrary to popular belief, serrations are completely practical. Especially Spyderco, though I have had a Leatherman with excellent serrations. I recently raised on another post the possibility of getting the two large blades from the standard and rescue G10 Clipitools placed in the same frame maybe side by side like the smaller PE/SE stainless clipitool. I think there may be a market for a ' 'simple' two bladed knife. Zip Ties and nylon straps aren't the only things that Spyderedges are good for. Any extremely tough or fibrous materials do much better with Spyderedges. And most all of those materials in those categories just don't respond well with plain edges and I can say that with 1000% accuracy because I've tried to cut those types of materials with super razor sharp, supersteel blades and they just don't do as good as Spyderedges do>> not even close. As far as the Dyad model goes it's true that the ergonomics on the original C-44 unit are not the best but I've always been able to work well with that model in spite of it. If Sal is in the process of tweaking and refining the design I'll be one of the first in line to pounce on one. Having a folder with the best of both worlds just makes great common sense IMO.